The Meadow Fritillary was more common and widespread in Massachusetts in the 19th century than today. A century ago, it was actually more frequently-encountered than our other smaller fritillary, the Silver-bordered Fritillary, and was found in many towns in eastern Massachusetts. Today the Meadow Fritillary has undergone a dramatic but little noticed range contraction westward, leaving the Silver-bordered as the only small fritillary in the east. “This species is one of the most common in the meadows...” wrote Newton naturalist Charles Johnson Maynard in 1886. In 1889, Scudder declared that “In the White Mountains and about Boston it is equally common, and besides I have it reported, or have taken it myself, at …Walpole, Montague, Amherst, Springfield, Belchertown, Andover, Worcester, Princeton, and Williamstown, Mass. (1889: 613-4).” Boston, Walpole and Andover are in eastern Massachusetts. Avid 19th century collector F. H. Sprague reported taking Meadow Fritillary in 1878 in Foxboro (eastern Massachusetts), as well as in North Leverett, and Belchertown in the Connecticut River valley (Psyche 1879). Sprague’s specimens at the Harvard Museum of Comparative Zoology and Boston University add Wollaston and Malden (8 specimens, 1883) in eastern Massachusetts, as well as Deerfield (3 specimens,1883, 1885) and Montague (2 specimens, 1885) in the west, to the list of towns. Other turn-of-the-century eastern Massachusetts locations include Wellesley (1889 A. P. Morse, and 1896 Denton mount, MCZ); Lexington (1897, C. Bullard, BU); Framingham (1906, C. A. Frost, BU); and North Rehoboth (1914, H. Clark, BU). (I have personally examined these specimens; they are indeed Meadow Fritillary.) There are eight specimens from Lowell collected by W. P. Atwood in 1890 and 1891, and two from Wellesley collected by A. P. Morse in 1899 in the Wellesley Insect Collection. There is a 1909 report from Nantucket and a pre-1900 specimen in the A. Bolter collection from Nantucket (Jones and Kimball 1943). Mid-twentieth-century eastern Massachusetts specimens also exist. At the Yale Peabody Museum, there are two specimens collected on Martha’s Vineyard, one from 1934 by L. Cleveland, and another from the 1930s or 1940s by F. M. Jones. (There are also several 1938 specimens from what is now Fannie Stebbins Refuge in Longmeadow, in the valley.) At Boston University are 1905-1919 specimens from Dedham and Princeton (n.d., C. W. Johnson). Root and Farquhar (1948) report a specimen from North Andover in eastern Massachusetts. In his 1934 overview of New England lepidoptera, D. W. Farquhar lists Meadow Fritillary as “common and general in wet meadows and bogs,” but does not give any specific locations. Reports of Meadow Fritillary in eastern Massachusetts continue at least through the late 1960’s. There is a 1951 specimen captured in Cambridge at Fresh Pond (no coll., MCZ). There are many mid-1960’s specimens from the Acton area, one from Littleton (C. Oliver, Yale Peabody Museum), and a 1964 report from Framingham (May 23, R. Holland; LSSS Corresp.). There is a 1968 (5/26) report from Essex (J. P. Holmes, LSSS Corresp). Lepidopterist Mark Mello reported to the MAS Atlas that Meadow Fritillary was still common in the New Bedford area in southeastern Massachusetts in the early 1960’s. Today, however, the Meadow Fritillary is completely gone from eastern part of the state. As Map 45 below shows, the furthest east it has been seen since 1990 is the town of Princeton. No explanation for this dramatic pull-back has been offered. Like the Silver-bordered Fritillary, the Meadow Fritillary probably benefited from the clearing of land for pastures, haying and timbering in the 17th,18th and early 19th centuries (Table 1). However, it did not benefit from the later increase in plowing, tilling and crop cultivation, since these practices destroy the host plant violets. Beginning in the mid-1800s, the trend in New England agriculture was toward “improving” hayfields and pastures; this meant the plowing the fields and planting them with imported timothy and clovers, both of which were more nutritious for cattle than native forbs. Even if such ‘improved’ fields were then left unplowed for many years, most violet species would be very slow to re-colonize them. The Meadow Fritillary has seemed more able than most fritillaries to adapt to such partly disturbed upland habitats, if they still contained violets, perhaps because of its use of the vigorous Common Blue Violet, V. sororia. In fact in eastern North America this fritillary expanded its normally northerly range southeastward in the first half of the 20th century, for example moving from mountains to lowland habitats in Kentucky, Ohio, Virginia and Maryland (Opler and Krizek 1984: 138; Iftner et al., 1992). Its presence in eastern Massachusetts, even to Martha’s Vineyard, until about the 1960’s, seems to have been another instance of this movement southeastward, as it apparently adapted to partly disturbed areas and lower elevations. After about 1960, however, Meadow Fritillary began to die out in the eastern part of this state (Table 2). In New York state, the observed host plants are Viola sororia, or common blue violet, and Viola pallens, or northern white violet (Shapiro 1974; cited in Opler & Krizek 1984). Both these species of violets are native to, and found in, every county in Massachusetts (Sorrie and Somers 1999). They are likely used here, but there are are no actual known records of what species of violet is used in Massachusetts. The 1990-95 Connecticut Atlas participants raised Meadow Fritillary in the lab on Viola odorata, or English or sweet violet, which is a mainly introduced species. Neither the Connecticut nor the Massachusetts Atlases produced any information about what violet species is used in nature. Descriptions of Meadow Fritillary’s preferred habitat give the impression of a habitat generalist. Allen (1997: 131) says that in West Virginia it is found in “almost any weedy field, meadow, or pasture,” preferring moister areas but found in uplands as well. Shapiro (1974) cites flat, “grassy wet meadows and pasture land, usually with Colias philodice” in New York state. NatureServe (2011) mentions “moist artificial grasslands such as hay meadows, pastures and roadsides, usually on rich soils” for the eastern part of the butterfly’s continental range. Although the Meadow Fritillary’s use of both wet and dry, and natural and partly disturbed, meadows is often cited to indicate its adaptability, this trait has not prevented its drastic decline at the eastern edge of its Massachusetts range. Ironically, the more specialized, wetland-dependent Silver-bordered Fritillary has not so far reduced its range in Massachusetts, nor declined as much as the Meadow Fritillary. The 1986-90 MAS Atlas found Meadow Fritillary in only 31 out of 723 blocs, compared to 90 blocs for Silver-bordered Fritillary. 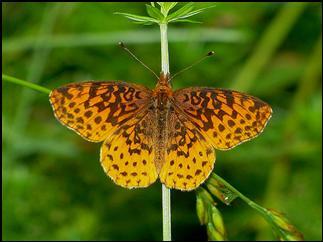 The Atlas termed it “uncommon and local, occurring largely from the Connecticut River valley westward.” MBC 2000-2007 reports also rank Meadow Fritillary on the low end of Uncommon, about on a par with West Virginia White (Table 5). A recent list-length analysis of MBC 1992-2010 data, published in the respected journal Nature: Climate Change, found a 34.8% decline in detectibility of Meadow Fritillary over these years (Breed et al. 2012). 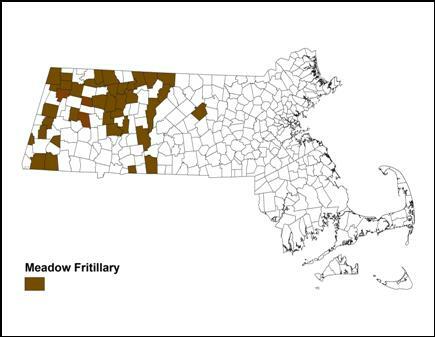 In this study all fritillaries in Massachusetts showed a decline except Great Spangled Fritillary. The trend of MBC sightings per total trip reports over the same 18-year period, shown in Chart 45, also suggests that the Meadow Fritillary declined in these years in the state. Note: Chart 45 includes all reports of Meadow Fritillary from NABA Counts for the relevant years; earlier statistics for Meadow Fritillary published in Massachusetts Butterflies No. 30, 32, 34, and 36 do not include all the early NABA Count reports, and thus are not accurate for this species. Much of our knowledge of the abundance of Meadow Fritillary in recent years comes from the long-running NABA Counts in the western part of the state. The two counts with the largest and most consistent numbers for this species are the Central Franklin and the Southern Berkshire Counts, shown in Table 45. The two other Counts which usually report Meadow Fritillary are the Northern Berkshire (low numbers, many years with no reports, but 30 in 1995, 6 in 2011, 2 in 2012, 10 in 2013), and the Central Berkshire (regular reports but low numbers, maximum 6 in 1996). The Northampton Count has reported a few (6 in 2010), and the Northern Worcester County Count reported 2 in 1998, but none since. Meadow Fritillary has not been reported from any of the other NABA Counts, covering eastern and southeastern Massachusetts, in these years. The Central Franklin count shows a pattern of decline from the double-digit numbers regularly reported in 1992-1998. The numbers of Meadow Fritillary found since 2001 have been low, with seven years in which none at all were found. By contrast the Southern Berkshire count numbers do not show a pattern of decline, although sightings have been quite variable from year to year. Meadow Fritillary has been reported from only 38 towns in MBC records through 2013 (Map 45), compared to 105 for Silver-bordered Fritillary. All Meadow Fritillary towns are west of the Quabbin Reservoir area except one. As first shown by the 1986-90 MAS Atlas, Meadow Fritillary continues to be found only in western Massachusetts. The furthest east town in MBC records is Princeton in northern Worcester County, where the species was once reported from Wachusett Meadow WS (8 on 6/20/2004, C. Kamp). The next easternmost report, from Monson, was of a single in 1999. In Atlas years, the furthest east town was Sutton, in southern Worcester County. There may have been some westward retrenchment since the 1980's. Meadow Fritillary is not usually reported in large numbers from any one site. There are a few locations at which larger numbers have been reported: Williamsburg MAS Graves Farm, 12 on 7/1/2007, F. Model; Williamstown Field Farm TTOR 16 on 6/29/2004, P. Weatherbee, and Clark Art Institute, 6 on 7/13/2013, T. Armata; Tyringham Breakneck Road, 6 on 6/2/2007, T. Tyning et al. ; Shelburne High Ledges TTOR, 12 on 5/28/2001, D. Peacock; Sheffield Bartholomew’s Cobble TTOR, 10 on 8/11/2011, S. Moore and T. Prince, and Lime Kiln Road 9 on 7/8/2011, T. Gagnon et al. ; Gill, 12 on 7/4/2005, R. and S. Cloutier et al. ; Ashfield Bullitt Reservation TTOR, 7 on 4/27/2012, G. Breed. On Nantucket, Meadow Fritillary has not been reported since the turn of the century (see above), and is presumed extirpated (LoPresti 2011). On the Martha’s Vineyard, Meadow Fritillary is also listed as “rare or extirpated” (Pelikan 2002). It has not been reported since about 1940. Both the Meadow and the Silver-bordered Fritillaries are probably gone from the islands --- following the path of the Regal Fritillary, which was once common on both islands, and now also extirpated. Mello and Hansen (2004) do not list Meadow Fritillary for Cape Cod, and there appear to be no historical reports. NOTE TO AMATEUR COLLECTORS: THIS IS A SENSITIVE, UNCOMMON AND PROBABLY DECLINING SPECIES IN MASSACHUSETTS. IT SHOULD NOT BE COLLECTED EXCEPT BY QUALIFIED INDIVIDUALS ENGAGED IN SCIENTIFIC RESEARCH COMPATIBLE WITH THE SPECIES' CONSERVATION. COLLECTING IS NOT ALLOWED ON MASSACHUSETTS AUDUBON PROPERTIES, OR ON TRUSTEES OF RESERVATIONS PROPERTIES WITHOUT A PERMIT. According to 1992-2008 MBC records, Meadow Fritillary has a long flight period, beginning in early May and lasting through September (http://www.naba.org/chapters/nabambc/flight-dates-chart.asp). There are at least two, and probably three broods, although the third brood may be partial, and may not occur in all years. The generations are not clearly delineated in MBC data, but three broods are likely given the length of the flight period into late September or October in some years. For example, in 2012 Pam Weatherbee observed a fresh individual near violets in her yard on September 3, after those flying in August had disappeared. Meadow Fritillary has two broods in the northern part of its eastern continental range, and three to the south. There are two broods in Maine, and three in the Delaware Valley in Pennsylvania (Opler and Krizek 1984). Layberry (1998) reports three in southern Canada, at Ottawa. Shapiro (1974) reports two broods in the Finger Lakes region of New York, but three in more southerly parts of the state. Connecticut Atlas data show three generations in that state (O’Donnell et al. 2007). A century ago, Scudder reported three broods for the vicinity of Boston, appearing early May, mid-July, and early September, with the third brood sometimes partial (1889: 614-15). Earliest sightings: In the 22 years of BOM-MBC data 1992-2013, the six earliest "first sightings" of Meadow Fritillary are 4/23/2012, 5/6/2013, 5/6/2004, 5/7/2000, and 5/7/1998, Williamstown, P. Weatherbee; as well as 5/7/2009, Whately, B. Benner. Pam Weatherbee's yard in Williamstown has provided most of the early and the late sightings of Meadow Fritillary. Interestingly, the MAS Atlas cited May 7, 1938, as its earliest known date. Thus, in 6 out of 23 years this species was first seen in the first week of May, and in another four of the years, it was first reported in the second week of May. Latest sightings: Meadow Fritillary was observed flying into October in two of the 22 years under review: one was seen on 10/11/2010, and one on 10/3/2007, both in Williamstown by P. Weatherbee. The next latest "last sightings" are 9/24/1995, Hadley, J. Center; 9/20/2003, Sheffield Bartholomew's Cobble, M. Lynch and S. Carroll; 9/19/2002, Williamstown, P. Weatherbee; and 9/17/2012, Williamstown, P. Weatherbee. Why this species withdrew from eastern Massachusetts has not been explained, but its present distribution in the state seems more consonant with its higher-elevation and northerly distribution on the continent as a whole. Still, its apparently low population numbers even in western Massachusetts are also something of a mystery. Meadow Fritillary should be placed on a Watch List for Massachusetts. Its decline here may be due primarily to climate warming (Table 6). We list it here as a Species of Conservation Concern. Known habitat which is in use should be monitored and conserved. Collecting should be prohibited without a permit. Fields hosting this species should be mowed no lower than 6" high no more than once a year in late fall, to keep the violets from being shaded out. Mowing part of the habitat one year, and part the next, is the safest strategy. With the exception of the Great Spangled Fritillary, all other Massachusetts fritillaries have already suffered some historical retrenchment, and all are likely to be adversely affected by climate warming (Table 6). Greater conservation awareness is needed to protect the Meadow Fritillary from further decline.